The ecology behind all cultivators that attack weeds in the crop row is essentially the same: disturb the shallow surface layer of soil above the rooting depth of the crop, thereby killing very small weeds without uprooting crop plants. All in-row and full-field cultivating tools are primarily successful against small-seeded weeds that must germinate near the soil surface to emerge, and in large-seeded crops that can be planted relatively deeply. Conversely, these tools are ineffective against large-seeded and perennial weeds that emerge from below the depth of operation, and they cannot be used in small-seeded crops unless the crop is transplanted. Deeper planting allows more aggressive weeding. Weeds are fully susceptible to in-row and full-field tools only when in the white thread and early cotyledon phases of development. Most weeds larger than this will escape unless the tools are used so aggressively that the crop is damaged. 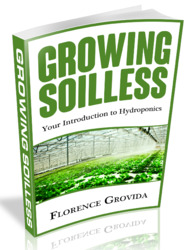 Consequently, successful in-row cultivation requires repeated removal of weeds while they are still very small. Such repeated working of the soil might seem contrary to good soil conservation. However, the operations are so superficial that damage to soil structure by the implements themselves is probably negligible, although repeated wheel traffic can contribute to compaction. Full-field implements affect the crop row and inter-row areas equally. They are primarily useful in close-planted crops like cereals, and for control of weeds in the crop row of wider spaced crops like maize, sorghum, and soybean when these will be cultivated with an inter-row machine later in the season. 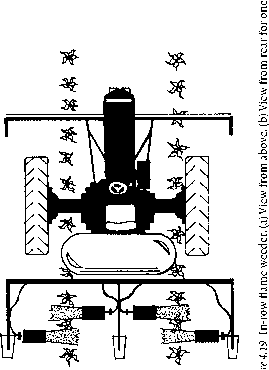 Full-field cultivators are of two types: rotary hoes and weeding harrows. A rotary hoe consists of two ranks of wheels, each bearing 16 spoon-like projections. The wheels are attached to the tool bar by spring-loaded arms to allow movement over obstacles. The ground-driven wheels typically penetrate to a depth of 2-4 cm and flick up soil and small weeds as they turn. To disturb the soil effectively, the machine must operate at high speed (11-21 km h_1). This allows rapid weeding of large areas.